Whereas most decisions as to what to take along to play to my friends at our evenings have been made in good enough time to ensure that the preceding days, if not weeks, have been spent immersed in the forthcoming offering, somewhat appropriately, Junkyard received its first airing in many years when I placed it on Rob’s turntable last Tuesday. You see, there’s only so much of Junkyard I can take. I think it’s a brilliant record, of course, but, for me, it’s such an uncompromising and exhausting listen that once every so often is enough. It made for quite a refreshing change as I was genuinely intrigued to hear The Birthday Party’s sophomore release again, wondering whether it would be as bludgeoning, scabrous and downright irreverent as I recall or if time and age had gone on to lessen its impact. I am pleased to say that, as far as I am concerned, Junkyard remains in exquisitely rude health, still sounding like a descent into a particularly troubled version of hell. For those of you not in the know, The Birthday Party were (along with The Saints) the progenitors of Aussie punk but where as The Saints made a relatively straightforward, Stooges-a-like mess of a maelstrom, Nick Cave and his mates gravitated towards a much more angular and dysfunctional sonic space, cacophanous…sure… but, just like their lead singer, spiky, lean and menacing. In other words – post-punk as opposed to punk. Junkyard has such a thin sound that at times it almost sounds like the feedback screech on Psychocandy…except there isn’t a whiff of feedback on this record just a lot of bottom, a gigantic helping of top and very little in between. What makes Junkyard so interesting is also what makes it so hard for me to listen to. It’s all about extremes – not only do The Birthday Party push the sound to the limit, Cave’s ‘singing’ veers from holler to deathly grumble and back again; always unhinged, often apoplectic, you hope for Cave’s sanity most of these vocal performances were single takes! Lyrically Junkyard pulls no punches. Right from the off it’s obvious Junkyard is going to cover some pretty radical and original territory. Who knows what came first, lyrics or music, but rarely have they complemented each other so perfectly. Take the funeareal eeriness of first track, She’s Hit, which sets the album’s stall out with the classic opening lines of: ‘There is woman pie in here. Mr Evangelist says she’s hit’. It is clear that even at this early stage of his career, Cave was travelling parts of the thesaurus other song-writers had yet to traverse. As opposed to more recent offerings from Cave, there’s no tenderness or melancholy here – Junkyard goes for the jugular with a length of barbed-wire and doesn’t let up until those barbs are well and truly embedded. 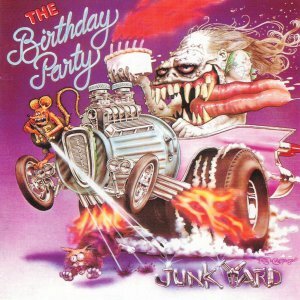 Although Junkyard turned out to be The Birthday Party’s swansong, it is surprising how much of a team effort Junkyard is. All members of the band are credited as song-writers yet there are no obvious cracks in Junkyard’s assault. So whilst Dead Joe, Big Jesus Trash Can, Kiss Me Black and Hamlet (Pow, Pow Pow) pummel their point home, 6″ Gold Blade, Seven Sins and Dim Locator aim for the same effect but get there in a more insidious and unnerving manner, their wiry guitars enhanced by some fantastic low slung bass runs from the unhinged hips of Tracey Pew. Final ‘song’ the eponymous Junkyard, is an incredible beast. To me, the song is the sound of a swinging guillotine heading towards the unsuspecting listener, the sound of The Birthday Party coming to finish off what they began those 40 long minutes ago. Is it any surprise I don’t listen to Junkyard all that often? Rob listened: There’s probably some way to work out which artist you are most committed to. Number of albums owned is too crude. Percentage is simplistic and flawed (I own 100% of the albums released by Crunt, but only 25% of the albums Bob Dylan has managed so far). There must be some way to balance how long and how deeply you’ve stuck with an artist. If only we have a mathematician in the group. Anyway, statistically speaking Nick Cave would probably sit atop the heap for me. I own all his records with the Bad Seeds and, so far, he’s given me no reason not to rush out and get whatever he releases next. Much of Tom’s description of Junkyard is like a dog whistle to me, scabrous swamp punk with a hollering madman beating his face into and through it. Give me more. However, like Tom, I rarely reach back for ‘Junkyard’ or, indeed, most of the first two or three of Cave’s records with the Bad Seeds, all of which still exhibited the pull of the Birthday party’s undertow. It’s not that I dislike them, far from it. The sound and the fury of these records are things I look for in new discoveries still, but I still find it hard to approach them in someone who is, as we have mathematically proven, one of my favourite artists. I’m going to conclude that this is down to nothing more than the sheer breadth of Cave’s body of work giving so much territory to spend time in that I just happened to have settled in the latter half. I genuinely believe him to be an artist who has got better and better, more and more relevant and impressive as the years have gone on, and so I feel fine sticking around West of ‘Tender Prey’. I love those oldies them when I hear them though, and I loved hearing ‘Junkyard’ once more this evening. Graham listened: Didn’t feel quite so old this week when Tom sprung this one on us all. 32 years later it is still the sonic assault I remembered, a dangerous currency shared only between those of my generation willing to experiment with such stuff. The bass lines are fantastic and the guitar sounds unworldly. Glad to be refreshed with it again, but not sure I need it again for good long time! Nick listened: I’d never heard this before, and it did pretty much what I was expecting. Enjoyably chaotic and discordant.